I sometimes hear surprised reactions when I tell people that our product focus is on desktop e-commerce. Many people are convinced that mobile e-commerce accounts for more than desktop and that desktop is rapidly dropping to zero. Actually, almost 80% of e-commerce transactions are made from the desktop and it’s growing by $10 billion / year. If you’ve ever tried to type in your credit card on a mobile device it’s not hard to see why. Didn’t I hear that mobile is 60% of all commerce? There were a lot of headlines around the rapid growth of mobile commerce during the 2015 holiday season. Most of the buzz came from a comScore report for the 2015 Nov-Dec holiday season that showed mobile commerce growing by 60% from the previous holiday to a total of $12.6 billion. Desktop e-commerce only grew by 6% to $56.4 billion in the same period. The percentage growth is a bit misleading (but makes good headlines) because mobile started from a much smaller number. If you look at the raw dollar amounts for the period, desktop grew by $3.1 billion and mobile grew by $4.7 billion. Still good, but doesn’t seem quite as impressive looking at the raw numbers. This news that mobile grew 60% got a lot of people to draw hockey stick graphs and jump to the conclusion that mobile e-commerce would overtake desktop in a few years’ time. But, one thing that can be misleading about mobile commerce is that it is comprised of both e-commerce (buying goods/services online) and in-store retail like the Starbucks app being used to buy an overpriced latte. In the same 2 month holiday period last year, about $1.2 billion of “mobile commerce” was from the Starbucks app, and another $1.3 billion was from Apple Pay at places like McDonalds and Whole Foods. Should we be Excited about the Starbucks app? Not that I have anything against Starbucks, but I wonder if we should really be including the Starbucks app when we look at the growth of mobile commerce, and using it to make predictions about the future of commerce. If we didn’t use their app, we would probably still buy the same coffee, at the same store. Maybe people buy a couple percent more coffee than they used to, but how much has commerce really grown or changed because of it? 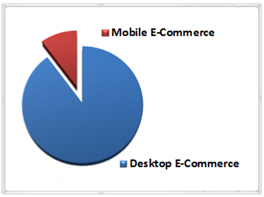 Breaking down Mobile Retail and Mobile E-commerce. A recent survey of Apple Pay users from Phoenix Marketing International showed that 62% of Apple Pay transactions happen in a retail store and the other 38% were for e-commerce. It’s hard to get an accurate breakdown of the types of mobile commerce, but my best estimate is that only half of the $12.6 billion reported for mobile commerce last holiday season was actually e-commerce. If desktop e-commerce was $56.4 billion, and mobile e-commerce is closer to $6.3 billion, 80% of e-commerce is still coming from the desktop. Mobile will catch up some day, but I think we are at least 10 years from mobile breaking even with desktop for e-commerce. Maybe using Chip Shield to enter payment details into your favorite mobile apps will help to speed up the process!